Convert MOV to MP4, WMV, AVI, MKV and other 1000+ video/audio formats. 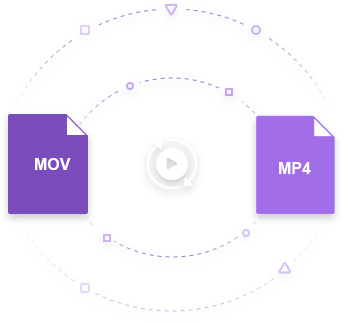 Convert MOV to MP4 without size limits and in a batch process. Customize converting settings with video editing, video compressing, and others. There are many advantages to use MP4 files, and the most obvious one is that they are much smaller (that is, they take up much less memory) than most other file formats. Besides, MP4 files are also very versatile. They can be used to store audio, video, subtitles, or any combination. It can even store 3D graphics and interactive content such as menus. The versatility of MP4s is what makes them so popular. On the one hand, like MP3 files, they can be used with all different kinds of devices, but on the other, you do not lose any quality of your original sound recording when you convert it to the MP4 format. MP4 files are compatible with many different types of devices, including many versions of the MPlayer, Quick Time, Windows Media Player, iTunes, and various Apple devices, such as iPhone, iPad, and all versions of the iPod. Since MP4 is the most desirable format in which to store your audio and video content, it may be tempting to convert MOV to MP4 online without any software installed. But it is not very easy to find a MOV to MP4 converter online over 100MB so that you can convert large MOV to MP4 files easily, especially, when you want to convert MOV to MP4 online over 500MB. With the size limitation for online converters, it is a good idea to use safe desktop alternatives for file conversion from MOV format to MP4 format. 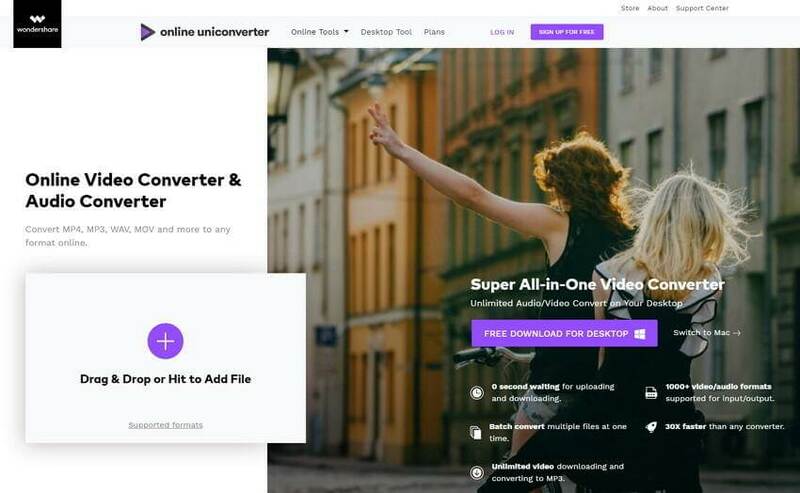 Online UniConverter (originally Media.io) is a free website for video conversion, which supports most common video formats such as MOV, MP4, AVI, MPEG, and others. You can convert MOV to MP4 online and free without any ads or watermark. Easy-to-use functions make you finish conversion within several simple steps. It also supports audio conversion which has less quality loss, and video compression is also available. However, like all online sites, Online UniConverter has a file size limitation on uploading files. It's totally free to use. Convert MOV to MP4 and vice versa without any software download, installation, or registration. Save converted files to Dropbox directly. 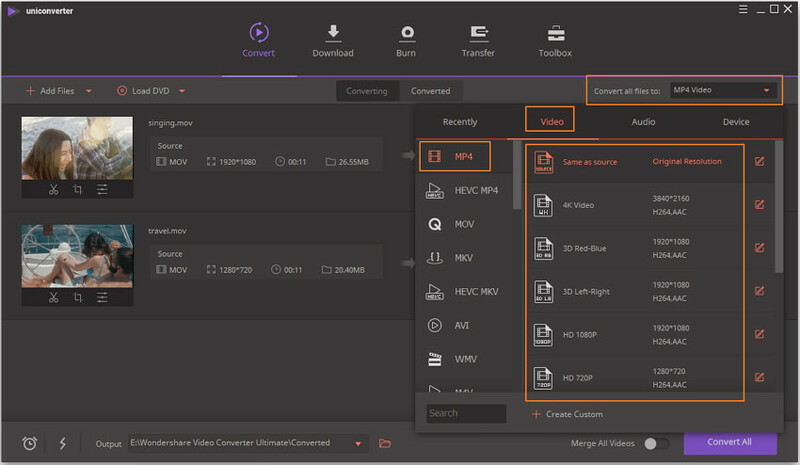 Compress videos by changing resolution, file size, and video format easily. This website is the top website to convert all kinds of files to other different formats. 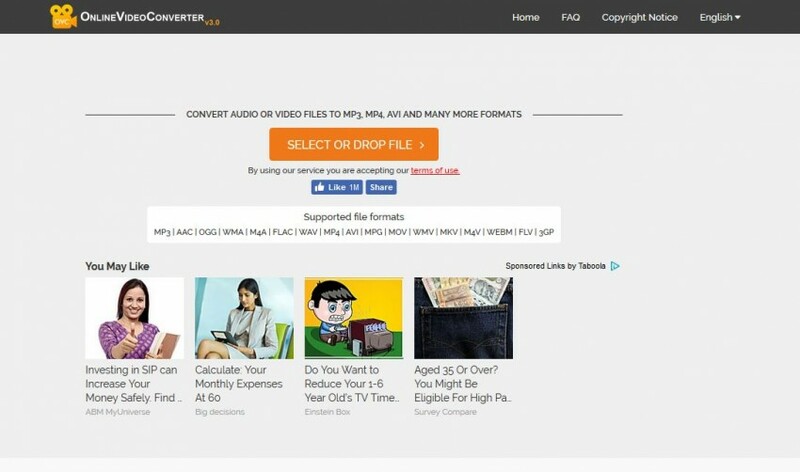 This website is an online converter website which enables users to convert MOV to MP4 online without downloading another third-party software in their computer. This website can convert audio, video, image, documents, Ebook, Archive and more for free. If you have a good Internet connection, you are able to convert MP4 to MOV online smoothly. This website is a totally free MOV to MP4 converter online, which allows you to get the work done without any effort. This online converter website enables you to convert multiple kinds of files. This online MOV to MP4 converter enables you to convert videos with its plugin. youconvertit is another online video converter website and enables you to convert MOV to MP4 easily. This website is fully compatible with Windows and Mac computers, and it works with popular browsers like Chrome, Firefox, Safari, etc. This free MOV to MP4 converter online enables users to send or receive files, download videos, and convert videos. This website also requires you to have a good Internet connection to get the work done, because you'll have to upload the videos to the website before conversion. This site enables users to convert MOV to MP4 format and send converted files directly to the users' email address. This online MOV to MP4 converter helps users to convert the videos with flexible process. Youconvertit also supports conversion of audio, video, document and images. Youconvertit site can help users to download videos by entering the video URL. ConvertFiles is a website which helps users to convert MOV to MP4 online or convert MP4 to MOV online free without any cost. This website can convert your videos from MOV to MP4 without downloading any software on your PC. This site works well in converting MP4, and it can also convert videos in VOB, MPEG, and AVI formats. If you want to convert MOV to MP4 online with website, you'll also need to upload the video files to this website first. This website helps to convert MOV to MP4 online without any need of third-party software. This online video converter supports to convert more than 100 video & audio formats. This website asks you to enter your email address to receive the converted files. This free MOV to MP4 converter online enables users to upload videos up to 250MB. 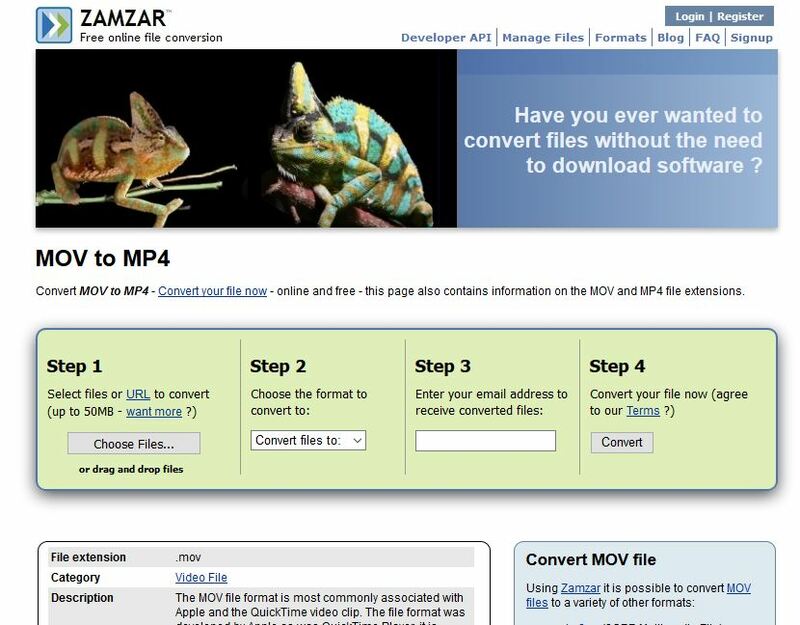 Zamzar is also a good option for converting MOV to MP4 online. This website is very popular among people to convert files in the MP4 video formats, and it is very easy to use. After entering this website, you'll only need to follow the instructions, and select files from your computer, then choose the output format as MP4. After that, enter your email address and then you'll be able to get the work done easily. This website can convert MOV to MP4, or other video and audio formats as well. This online MOV to MP4 converter can easily convert videos and directly email them to your email address. Zamzar allows you to convert up to 50MB of MOV videos to MP4 format using zamzar. This online converter allows you to convert up to 18 video and audio formats easily. Online Video Converter is also a good solution to convert MOV to MP4 online. This site also converts videos in your browser directly without downloading any third-party software. This website enables users to download videos as well from YouTube or some other video sharing sites. There are 3 ways available on this website to convert audio or videos. You can convert videos by entering URL or by uploading from your computer or by using the browser extension of the website. This website supports online video converting from MOV to MP4 format for free. This website has browser extension as well and enables you to convert videos using extension. Online video converter website is mobile compatible and users can easily convert videos using Android or iPhone. This website supports so many formats and there is no limitation on the size of videos. At times, you'll want to use the desktop MOV to MP4 converter to convert videos because the desktop converter will provide very stable converting process and high-quality converted video files. Among all the video converters for Windows and Mac computers, Wondershare UniConverter (originally Wondershare Video Converter Ultimate) is regarded as the best alternative to convert MOV to MP4 online. This MOV to MP4 converter enables you to convert videos to more than 1000 video and audio formats with easy steps. You can add MOV files in batch and without any size limitation, MOV video size compression even provided here if you need. Video editing features can also be done here if you need MOV to MP4 creation. Convert large MOV videos to MP4 or other 1000+ video formats with super fast speed. Convert multiple MOV videos to MP4 in batch and withoout size limits. Edit MOV videos before converting to MP4 with trimming length, cropping parts, adding watermarks, etc. Download YouTube videos and playlist to MP4 or MOV format by pasting URLs easily. Burn MOV and other formats videos to DVD/Blu-ray disc with free menu templates. Transfer MOV/MP4 videos to mobile devices for playing via a USB cable. Additional video-related functions such as Fix Video Metadata, Screen Recorder, GIF Maker, Cast to TV, etc. Supported OS: Windows 10/8/7/2003/XP/Vista, and Mac OS X 10.14 (Mojave), 10.13, 10.12, 10.11, 10.10, 10.9, 10.8, 10.7, 10.6. Download and install Wondershare UniConverter on your computer, then launch it. 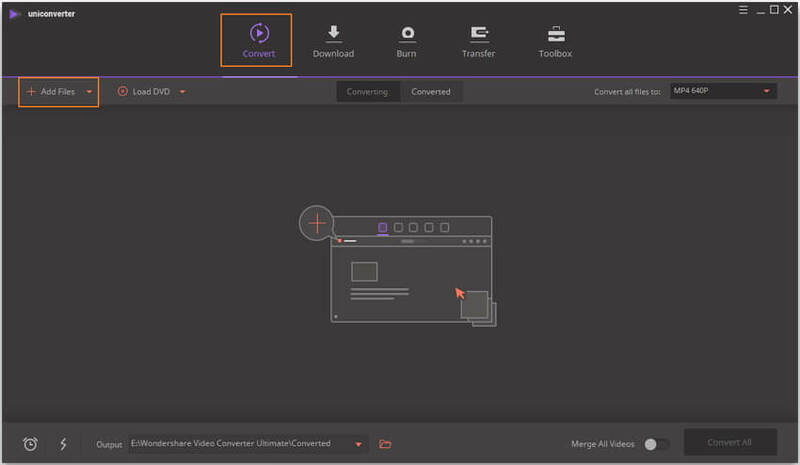 You'll come to the Convert tab by default, click on the Add Files button to add the MOV video into the program. Or you can drag and drop the files to the interface directly. After adding the video into the program, you can move to the Convert all files to: button at the upper right corner of the main interface to call up the pop-up dialog. Now choose MP4 and the resolution from the Video tab. Step 3 Compress Video Size (Optional). From the main interface, click on the compress icon on the Target bar. 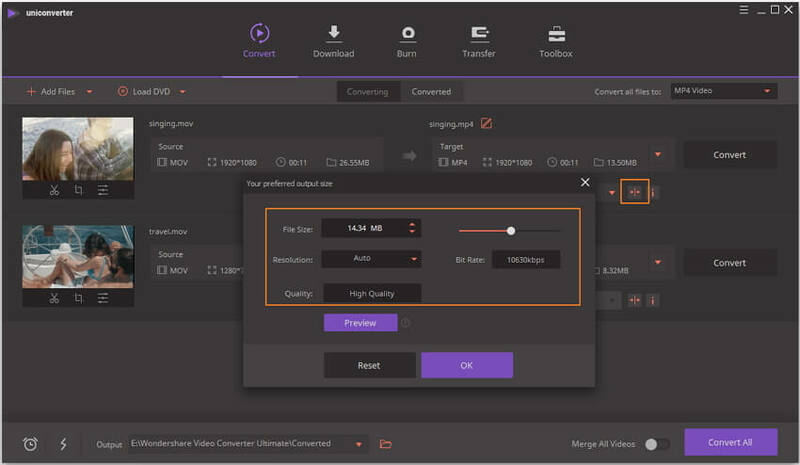 A video compression window will open, you can change parameters like bit rate, video resolution, file size easily and quickly at here. Alternatively, you can click on the edit icons on the video thumbnail to trim, crop videos if you like. Step 4 Start converting MOV to MP4. 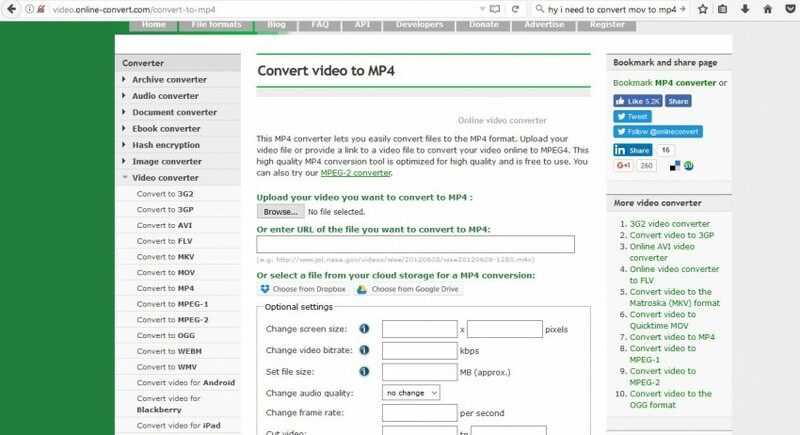 Now click on the Convert button to start converting MOV to MP4. When the conversion finishes, you'll be able to find the downloaded videos in your computer by clicking the Converted tab on the top of the software window. Conclusion: This article is talking about online MOV to MP4 video converters, and we have also discussed the best way to convert videos offline without Internet and size limits. All online ways need you to have the Internet connection and without it, you can’t convert any video. 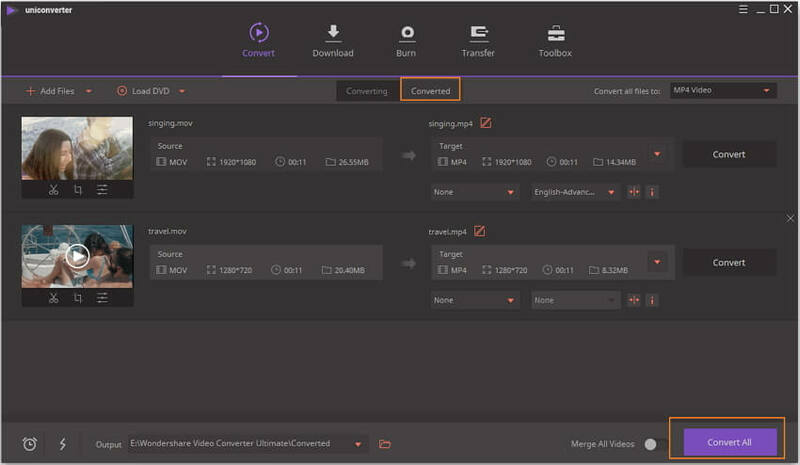 Wondershare UniConverter can convert MOV to MP4 and vice versa without Internet connection at 30X faster speed than any other video converter program. Free download and install it on your PC/Mac, follow the steps above to convert MOV to MP4 easily.